One of several press releases. This is one was from November 1, 2004 that combined two of my favorite subjects: music and running. Great memories of PR work for this group, which has changed the original lineup since then, and writing about them and other quality bands during my music columnist days at the Sentinel-Tribune in Bowling Green, Ohio. La Revancha’s energetic sound is hard to describe – It’s not totally rock, folk, blues or jazz, it’s just a great mix. Bowling Green, Ohio-La Revancha, a Latin/world musical group, will play at this year’s New York City marathon! Watch the popular music group La Revancha (www.larevancha.com) play their energetic music in front of thousands of people for two days as part of the 35th annual New York City (NYC) Marathon festivities sponsored by the New York Road Runners. La Revancha plays on Saturday, November 6 beginning at 7:00 p.m. at Tavern on the Green for the NYC Marathon VIP Party and Opening Ceremony in New York City. The musical group will perform at the pre-race celebration held at a location near the main finish line in Central Park. The performance will begin at approximately 7:00 p.m. (before and after fireworks display) and will conclude no later than 8:30 p.m.
La Revancha will also play on Sunday, November 7 from 10 a.m. to 2 p.m. at Columbus Circle for the NYC Marathon Goal Line VIP Party and Celebration in New York City. La Revancha’s new album, “El Zarape”, is already receiving airplay from radio stations. La Revancha relocated to Bowling Green, Ohio from Los Angeles, California in January 2003 after recording an EP called “Locura” in late December 2002. 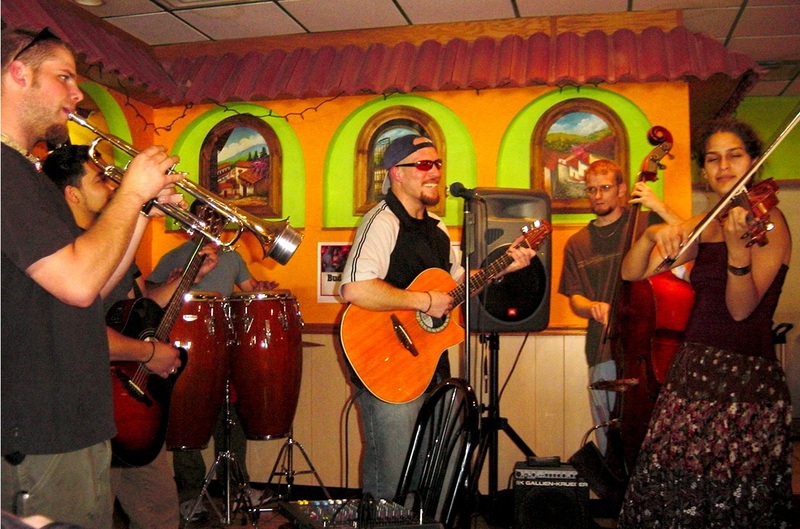 La Revancha has played at a variety of large events, nightclubs, rallies, marches, belly dancing competitions and other venues, including the El Zarape restaurant, which their current album is named after. La Revancha just played in New York last weekend and enjoys sharing their music. “Our band has so much fun up there no matter what the weather is like, which spreads an energetic, contagious energy to our audience,” add Ruiz. “Everyone in the band has so many different backgrounds,” adds Ruiz. “You have a drummer (Jason Parritt) and an electric guitar player (Mike Dooley) who have played with hard-core metal bands most of their life ; then you have a violin player (Katalina Jara) who has performed with multiple orchestras and jazz ensembles, a trumpet player (Joe Zimmet) heavily influenced by blues and jazz; a bass player (Blane Smead) with roots & folk influences, and finally a rhythm guitar and singer (Leonardo Ruiz) who likes to get heavy on the instruments and to play with the voice to create new arrangements for songs.” Find more information about La Revancha’s history, lyrics, music and shows at www.larevancha.com. The New York City Marathon is the story of up to 35,000 athletes on a celebratory journey through the world’s most vibrant city. The premier event of New York Road Runners, the marathon is viewed by two million spectators lining the course and supported by 12,000 volunteers, dozens of loyal sponsors, and many city agencies. Founded in 1958 with 47 members, The New York Road Runners (www.nyrr.org) has grown into the world’s foremost running organization, with a membership of 40,000. NYRR conducts more than 100 events each year, including races, classes, clinics, and lectures. In addition, the NYRR Foundation creates school-based running teams through Running Partners, a youth development program serving schools with few or no recreation programs. This entry was posted in Music Reviews and tagged La Revancha, Michael Siebenaler, Music, Tall Writer. Bookmark the permalink.